Following up again on our Wild, Wild West studies, we've continued to hunt for titles relating to the various important animals that you might encounter out west. Of course, one of the most important animals that were used in the glorious olden days was the horse. So we took a few days to explore both information about horses and their great and varied uses, as well as to talk about some rather famous literary horses. One of the first sources we checked in with was Sleeping Bear Press because, of course, we had to. I knew we'd find some really interesting titles in their line-up and I was absolutely correct. 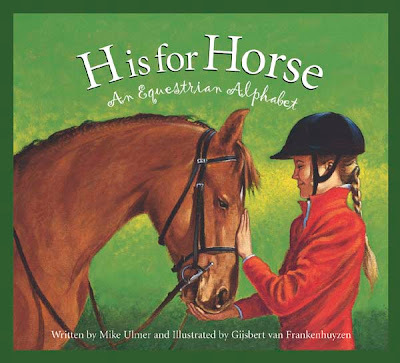 From A to Z we explored the world of horses. It all starts with 'A', of course, which stands for Arab. We move on through the alphabet learning about everything from riding lessons, manure, Quarter horses, vets and concludes with how horses catch their Zzz's. Illustrated by Gijsbert van Frankhuyzen (say that 10 times fast!) and you've got a beautiful book on this marvelous creature. Although we definitely enjoyed learning about horses via the alphabet, I think we all enjoyed Black Beauty's Early Days in the Meadow even more so. 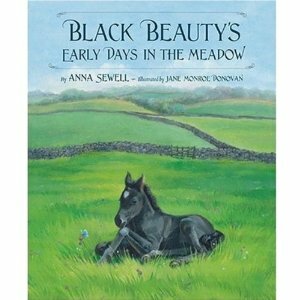 This classic story picture book is illustrated by Jane Monroe Donovan and gives us an account of Black Beauty's early days through the voice of Black Beauty. This book tells the story of this famous horse's first few months of life. This is a beautiful introduction to a classic tale and a book I am certain we will revisit time and time again. We loved it! Thanks to Sleeping Bear Press for providing some copies for us to enjoy. Again, I recommend them to you for regular reading materials but specifically for thematic unit studies. For more books on horses (and cows!) that we have been reading lately, visit Reading My Library where we talked about horse and cow picture books that we discovered and have been making good use of. Ah, yes, thanks for the reminder to check into the Alphabet books. That looks like a great way to tie up a unit study. I wonder, not remembering, but do you think you'll educate your children at home? Just wondered--you would have so much fun doing so. BTW, I finished The Strictest School in the World and had great fun writing my review of it--thanks so much for the tip. Black Beauty is such a classic, and the alphabet book looks like fun, too. I enjoy looking at alphabet books just for the variety sometimes. These look like BEAUTIFUL books.